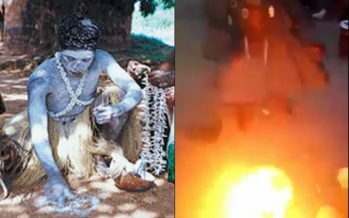 Renowned Kumasi-based Fetish Priest and Father of Sacred Miracles,Okomfuor Yaw Appiah, few days back, burnt the Holy Bible to ashes at his shrine situated in Kronom, a suburb of Kumasi in the Ashanti Region. The exact Fetish Priest who once taunted the Founder and General Overseer of International God’s Way Church (IGWC), Bishop Dr. Daniel Obinim to meet him at the Jubilee Park in Kumasi and prove to all Ghanaians the one who possessed Greater Powers, deliberately burned the Bible, following vexatious jabs thrown at “ANTOA NYAMAA” by controversial Sofo Kyiri Abosom rendering Antoa Nyamaa powerless. In the 2minutes 50seconds video, OKomfuor Yaw Appiah was loudly heard calling Sofo Kyiri Abosom FAKE, a FRAUDSTER, and UNGODLY. According to him Kyiri Abosom has thrown dust in the eyes of Ghanaians for quite a long time and this is the unerring season to uncover his BAD deeds extensively to all Ghanaians and the world entirely.